We are a very budget oriented family. I have a very strict grocery budget each month, and I do my very best to stick to that budget. However, sometimes my artistry in the kitchen gets the best of me and before I know it, we are only half way through the month and I have nearly blown my entire budget! This is when, instead of panicking, I start getting really creative. Most of us have random ingredients laying around in our refrigerators and pantries that just sit there due to lack of inspiration. It is in moments like this that those random elements really come in handy. Today's recipe is the perfect example of that! 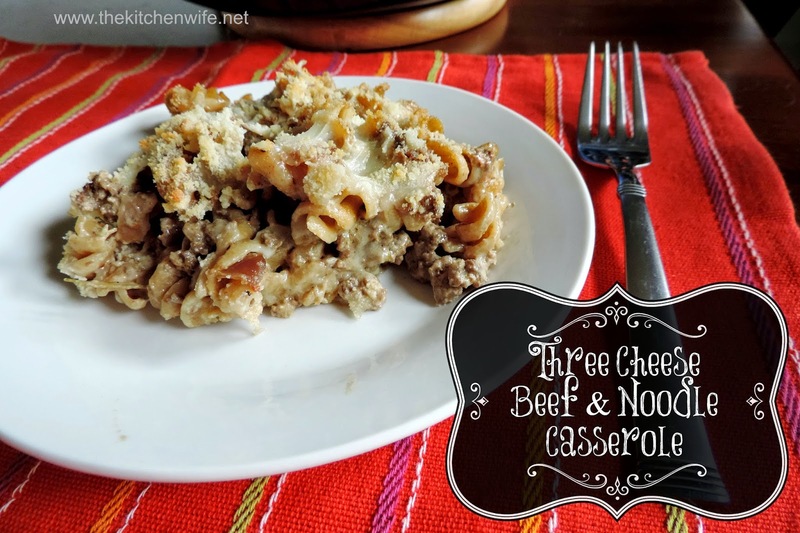 Three Cheese Beef and Noodle Casserole. This is my first time making this, but I tell you what...it CERTAINLY won't be my last! 1/2 c. Cherry Tomatoes, halved or a 15 oz. Can of diced tomatoes. 8 oz. of Mozzarella, shredded. Since this is a beef and NOODLE bake, you will need to bring a pot of water to a boil. Add the pasta of your choice, and cook according to the instructions on the box. In a hot skillet, add 2-3 tbsp. of oil, the tomatoes, onion, and green pepper. Cook Until the onions are soft and translucent, the peppers have softened, and the tomatoes have started to blister. About 3-5 minutes. Next add the garlic and chili flake to pan. Cook until you smell them coming from the pan. Cook until done all the way through and there is no more pink. Add the beef base or bouillon to the pan and mix in well. Add the water and let the liquid reduce by half. Now it is time for the cream cheese. Allow it to melt into the ground beef as you stir it in. Now, for that little boost of flavor, add a tbsp. of Worcestershire Sauce. Stir it all together and you have the base to this casserole finished! Add the cooked pasta to the skillet and stir it all together. If you are using an oven safe skillet, you don't need to do anything here, but if you are not, you will need to transfer this into a baking dish. Then, with the grated Parmesan. Cheesy, crunchy, meaty, *sigh*! You would never believe that I just grabbed some random leftovers from the fridge and pantry and threw them together. My husband and mother-in-love inhaled it, and I assure you it will be on the menu again! So the next time you find your funds running low, don't panic, get creative! And I HIGHLY encourage you to give this pantry mash-up a try tonight! You are going to love it! Bring a pot of water to a boil and cook the pasta of your choice according to the directions on the box. In a skillet, add 2-3 tbsp. of oil, the tomatoes, green peppers, and onion. Cook until vegetables are soft and the onions are translucent. Add the garlic and chili flake. Cook until done and no pink it showing. Add the beef base or bullion. Stir into the mixture. Add the water, stir, and reduce the liquid by half. Add the cream cheese. Allow it to melt into the beef while stirring. Add a tbsp. of Worcestershire sauce and stir in. Place in the oven and bake for 20 min. *If you are not using an oven safe skillet, you will need to transfer into a baking dish at this point.